My absolute favorite is Chanel. I love the tweed, the two-tone pump, simply the style, the typical Chanel-style. But Karl surprises us every single show. We see a perfect show, in a perfect setting, with perfect looks. But every show we see something else. Some designers are Always the same, some of them never are, but you can't tell if it's their collection. Not Karl, one collection isn't (definitely) the other, but we can clearly see it's the Chanel show. And that's what I love about Chanel. Now this show has blown me away, again. I'm in love with every single look. From the tube-dresses till the amazing dip-hem dresses. -Amazing shoes. You might have thought "nice thights", but they were shoes. Long, open-toe, shoes. 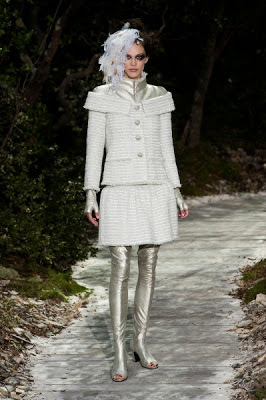 Here is a review of the Paris Fashion Week: Haute Couture S/S 13: Day 1. What exactly Haute Couture is can you read here , in my previous blogpost. DAY 1: MONDAY 21 JANUARY 2013. Soft colors or dark colors. HAUTE COUTURE, WHAT IS THAT? It's the most fashionable time of the year for me. In a month there are the F/W collections (my favorite!). And now there are ofcourse the Haute Couture collections. Paris Fashion Week will always be more special to me than the other Fashion Weeks. Paris has my favorite designers. A close second is Milan, but Paris has my heart. Now, the haute couture Fashion Week ends tonight. For those of you who wonder what exactly haute couture is, I'll explain. Haute Couture is a special collection. The F/W shows for example are prêt-a-porter, ready-to-wear. You can buy items in shops, in several sizes, in several countries. You may have noticed that haute couture is usually more "excentric" than the ready-to-wear collections. That is true. In Haute Couture there will be more creativity, because haute couture is pure art. The designer can and will experiment. Haute Couture is very rare and therefore also very expensive. In France there are guidelines for Haute Couture. - The clothes must be made in the own atelier (workshop). - There must work at least 12 people in the atelier. - There must be a show twice a year, with at least 50 different pieces. - There must be at least 3 models. - There must be a special space where the collection can be showed to the regular customers. The guidelines come from le "Chambre Syndicale de La Couture". They also appoint the couturiers. Here is a list of the "official" haute couturiers appointed by le Chambre Syndicale de La Couture. So now you have an idea of what Haute Couture is. In the next post I'm going to give all the highlights of Paris Fashion Week: Haute Couture S/S 13!